There has been a centuries-old divide within London – only being rebalanced in recent times – that consigned the East End to remain to this day an area of relative (and often actual) poverty. Westminster has always been the seat of royalty and government and during the 17th and 18th centuries became the home of the wealthy in their newly-planned squares. The City had previously been the major workshop and port of the metropolis but was rebuilt after the Great Fire in the 17th century and increasingly evolved as purely a financial centre. Much of the grimy industry was pushed eastwards, and the docks expanded in the same direction, out of sight of the moneyed upper classes. Unlike areas such as the City and Mayfair there was little in the way of town planning, development was haphazard, and the working people who toiled in the sweat-shops and docks of the east lived in ever more crowded and squalid conditions. It may not be a glamorous story of wealth and royalty but the East End nevertheless has a fascinating history which is an important part of understanding London as a whole. 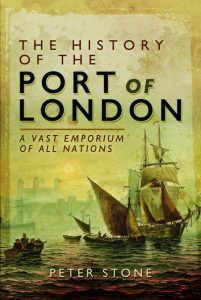 The growth and demise of the London docks, the waves of immigrants during the 19th century, the Jack the Ripper saga, and the devastation caused by bombing during the Blitz are just some of the more obvious chapter headings. 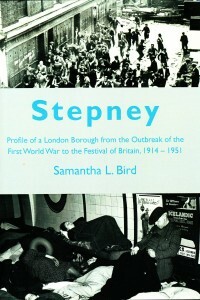 In her newly-published book Dr.Samantha Bird takes us through the major issues that took place in the former borough of Stepney, at the heart of the East End, in the period from the outbreak of the First World War until the Festival of Britain shortly after the Second World War. Stepney, now part of Tower Hamlets, is a relatively small area of London and just a short period of time is covered yet as Bird ably demonstrates developments were taking place at a giddying pace. Three intertwined themes dominate much of the period: vibrant local politics; the large immigrant population, notably Jewish and Irish; and the borough’s dense, overcrowded slums. The almost exclusively working-class population made the East End a natural bastion of the Labour Party from the passing of the Suffrage Act in 1919, which dramatically increased the electorate of the area. Yet the Jewish people of Stepney added a local twist by their support for the Communists, which first provided that party with places on the local council and then a seat in Parliament at the 1945 General Election. The Communist Party was especially popular locally because of their tireless campaigning for improved housing conditions and safer bomb shelters during the Second World War. In parallel with events on the Continent, the mid-1930s also saw the rise of the British Union of Fascists. The climax was the Battle of Cable Street, when the Communists, Jews and other residents faced up to the ‘Blackshirts’ to prevent them marching through the streets of Stepney. Ironically, when the Communists of Stepney enjoyed their finest moment, at the 1945 election, the borough’s most notable local politician, Clement Atlee, entered No.10 as the country’s new Prime Minister. It was German bombers rather than British politicians that finally solved the overcrowding problem. The ending of the war brought the promise of the rebuilding of Stepney, with perfectly-planned estates of local authority housing. Large numbers of modern new dwellings replaced the former slum districts on a scale not seen in London since the Great Fire of 1666. However the borough lacked a visionary of the stature of Sir Christopher Wren and the final result was piece-meal and disjointed. I suspect that if this book was brought up to date we would find many of the issues of the 1920s now repeated, with Bengalis replacing Jews and tower blocks instead of back-to-back terraces. As Samantha Bird points out in her preface, many histories of the area have dealt with the 19th century and the wider East End but she has instead chosen to concentrate on the period covering the middle of the 20th century and specifically on Stepney. In doing so we miss much of the preceding story that led to the points she deals with. It could also be argued that a number of those issues covered – for example the rise of fascism or the post-war London dock strikes – took place over a wider area of East London than the narrow confines of one borough. Bird has included detailed research into local politics, particularly of Labour and Communist activity, yet there is a lack of corresponding information regarding the BUF. The dramatic reduction in the population of Stepney during and immediately after the Second World War is highlighted (as is the building of the new satellite towns around London) but little mention of where those people went. Another gripe is that the book, which reads much like a research paper at times, could have done with a little sub-editing. These are minor criticisms however. One of the fascinations of Bird’s ‘Stepney’ is how this tiny and poverty-stricken borough played such a leading role on not only a London platform but occasionally also a national and international stage. We quickly travel from Cable Street to the Spanish Civil War, from the People’s Palace on Mile End Road to the West End’s Savoy Hotel, the national General Strike to London’s dock strikes. Along the way we encounter communists, fascists, bishops and a Prime Minister. Samantha Bird has clearly done her research and has produced what, to my knowledge, is a unique work. Local issues break out into international narrative, making this a surprisingly fascinating and easy read beyond its East End themes. Its high cover-price of around £40 means that it is more likely to be found in a library than on the bookshelf at home but I recommend those interested in 20th century London history to seek it out for an excellent insight into an important part of our city’s past.